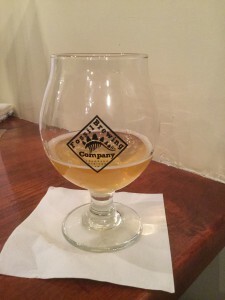 Fossil Brewing Company’s Knochenweizen Hefeweizen is a true Hefeweizen. It has been a long while since I have had a true to form Hefeweizen. Talking with Josh Bye, the brewmaster, he indicated he also wanted the true characteristics of a Hefeweizen. Knochenweizen’s aroma is full of the esters from the yeast and sweetness. The taste has wonderful banana flavors with a mild sweet finish. 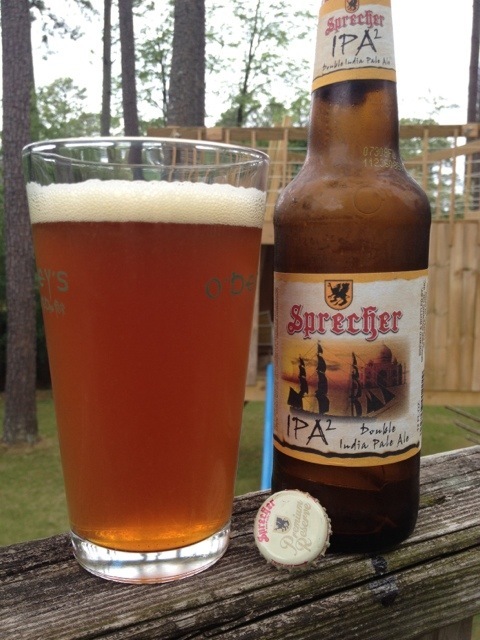 The carbonation is helping create a nice full mouth feel, which is perfect for a Hefeweizen. Fossil Brewing Company is creating some very tasty brews and the Hefeweizen is a great example of what they can do in their brew house. 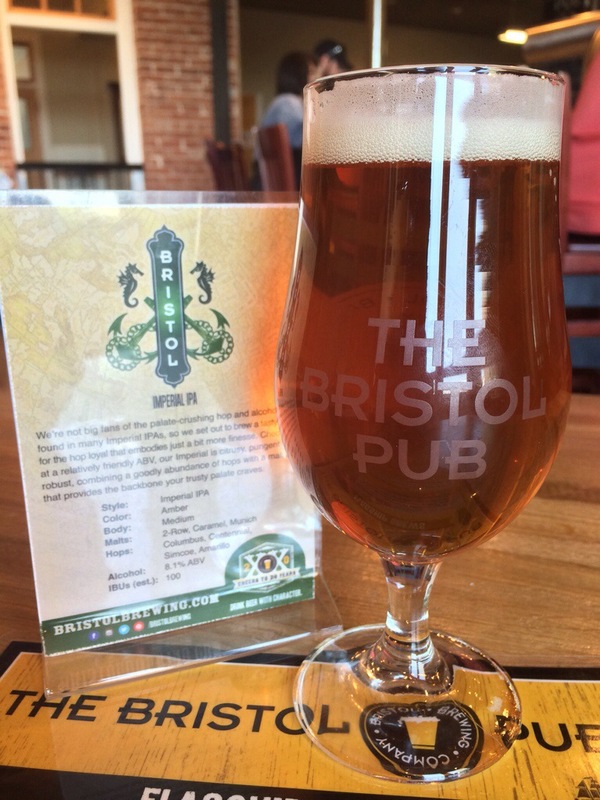 Bristol Brewing Company’s Imperial IPA pours up a copper to deep golden color showing hints copper in the head. The head is rich and very lacy for an Imperial IPA. The aroma has hints of citrus with bit of maltiness finding it’s way into the background. 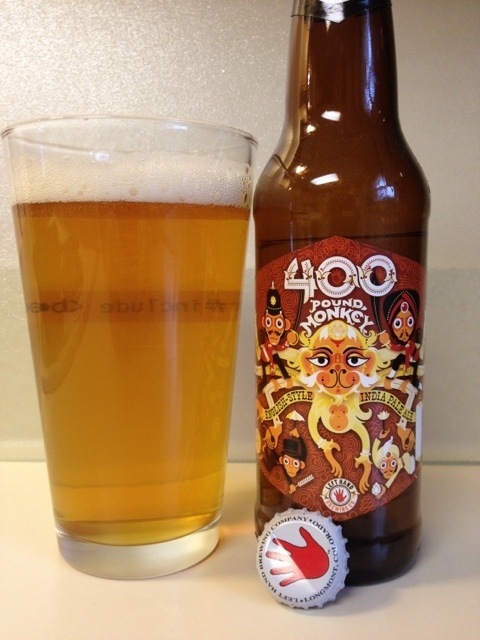 The Centennial, Simcoe, and Amarillo aromas are very nice against the background of this beer. There was an expectation for a bigger nose. The first glass on release day had a huge nose. This glass lost a bit of the initial aroma from last week. The initial taste is of a deep hop flavor on the tip of the tongue and only increases as it fills the pallet. The Columbus hops hold up well in this big beer. The malt and hop flavor present in a way that would go well with a meal like a sheared steak or smoked items such root vegetables or chicken. The finish leaves the mouth with a rich blend of hop characteristics pouring over the mouth and fades to make way for the next taste. Bristol Brewing Company indicates they use 2-row, Caramel and Munich malts. The hops are Columbus, Centennial, Simcoe, and Amarillo. Overall, I really enjoyed this Imperial IPA. The 8.1% ABV keeps this beer from taking you off the chart too much. It would be great if this was a year round brew for Bristol Brewing Company. It is available in draft for a limited time and while the bombers last. The 4 mile walking round trip, from The Antlers, makes this beer even better. 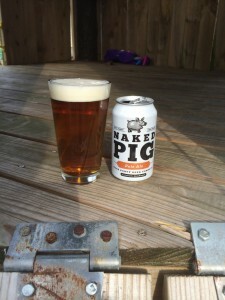 Back Forty Beer Company’s Naked Pig Pale Ale has come out in cans. It pours up nicely with a nice clear pale copper color. The aroma is nice and mellow with a hint of maltiness, grains, and a light hoppiness in the background. The flavor has a bit of nuttiness complemented by mild hop finish. I know many people are bottle loyalist, but I can see this beer having a good future at the ballparks, the poolside, and at the beach. 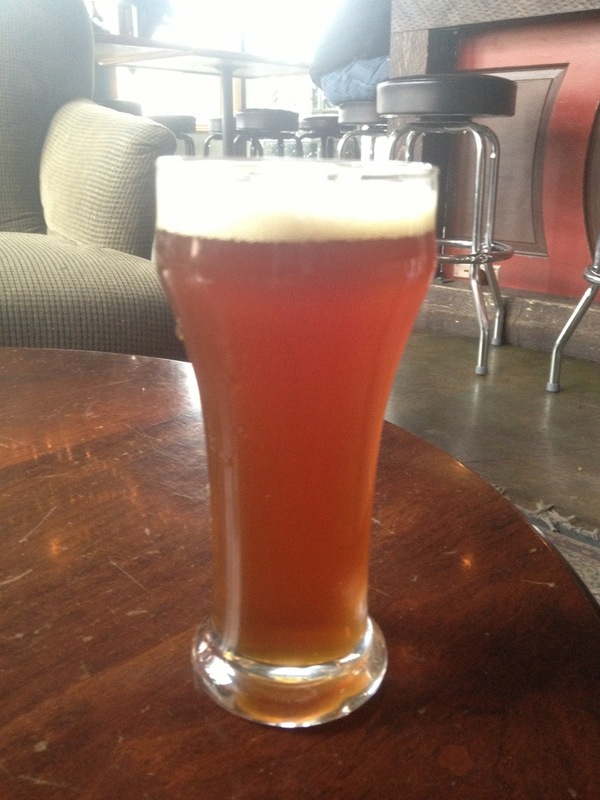 Good People Hitchhiker is an American IPA that pours up nicely with a rich head that leave lots of lacing. The color is a light copper and very clear. The aroma is very mild, but the humidity is very high and that could be affecting the aroma. The taste starts with a malty hop flavor that turns toward the hoppy side in the finish. Overall, this is very enjoyable addition to the Good People IPA lineup. The ABV of 7.4% is sitting right between their IPA and Snake Handler (Double IPA). 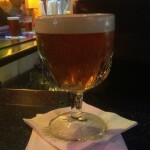 Funkwerks Solenna (Bastogne) pours up with a rich head that clings to the glass. It has a clear copper color that hints of golden colors at the edges. The lacing is very nice. The aroma has fruit overtones with a mix of hops hiding in the background. The taste starts out with an alkaline aspect that holds on past the finish. But quickly, the flavor shifts to spices and peat flavors. The malty flavor come in during the finish as a nice surprise. The mouth feel is driven by the clinginess of the flavors. The medium body holds on only for a bit and fades quickly in the finish. Overall, Funkwerks Solenna is a very enjoyable beer. I could enjoy this beer while sit on my deck and sharing it friends to push their beer boundaries. 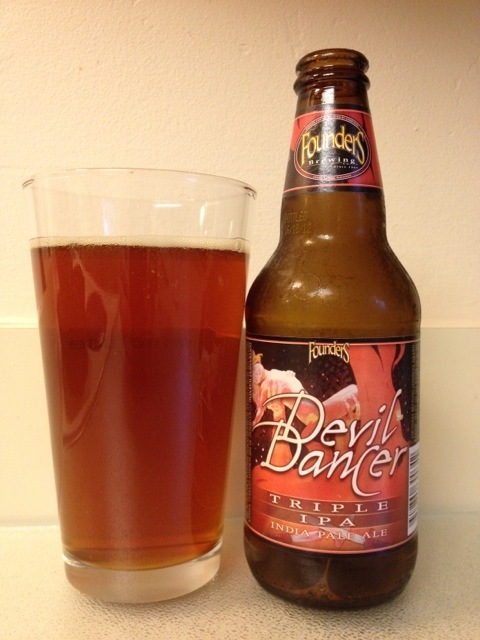 Founders Devil Dancer is a triple IPA. 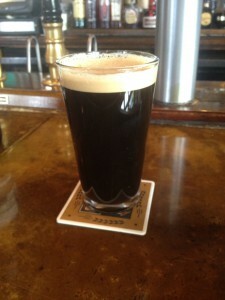 It poured up nicely with a rich copper color and minimal head. The aroma shows the presence of the high alcohol right away. The hops bouquet is nice but not too floral as was expected. The taste of this beer is driven by the big characteristics of it with a high alcohol, big hop profile, the bold malt flavor, and heavier body. Finish presents with the heat of the alcohol. There’s a nice sweetness throughout the whole beer’s flavor. But the hops, they hold on throughout the taste, but they’re not over-the-top. The mouth feel is driven by the strong malt backbone giving it a deep thick body, that is for I PA. 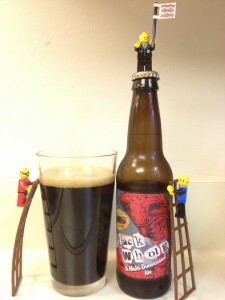 The high ABV creates an interesting character in the mouth feel especially in the finish. Overall, Devil Dancer is a very impressive beer. The 12% ABV makes this beer something to be enjoyed gradually so that you fully appreciate all the characteristics from the beginning to the end. I appreciate that there’s quite a few more of these waiting in the refrigerator. Cigar City Brewing Black Whole poured up very nicely with a head that faded quickly to a minimal amount of head that stayed throughout the drink. The color is a rich brown to deep dark copper. The aroma is rich in chocolate and a spice that can’t be placed. The taste is dry with chocolate flavors throughout. The chocolate is not too much in that it will not overwhelm. The alcohol heat is barely detectable. Overall, this is a very enjoyable beer. The chocolate flavors would make this good with a dessert or as an after drink beer. Sprecher IPA2 poured up nicely with a good head that faded slowly. The color is a rich copper color. There are particles in suspension in the beer with some being large and some being small. The aroma is mild for what I would’ve expected from a double IPA. There is a hint of pine in the aroma. Given the limited hops in the aroma, I wonder if the beer is old. There is no obvious date on the bottle, but there is a code which I guess the brewery could figure out. The taste is kind of mellow. There are hops flavors throughout, but they are ill-defined. There is a medium body to the beer. The body seems about right for what I would expect from a double IPA. Overall, I was hoping to be more impressed with a double IPA. The ABV is 7.72%, which doesn’t put it too of outreach for drinking a couple of them with friends. I am concerned that this was just not a fresh batch as I picked it up at a local grocery store. Left Hand Brewing’s 400 Pound Monkey has a small amount of haze in the deep gold to a light copper color. The head fades with a good bit of lacing left behind. The aroma is very mellow for what was expected. Hops characteristics present nicely with slight pine flavor. No wheat is detected in the aroma, but I’m not sure how much is in the beer to contribute to the aroma. The flavor starts out with a mild bitterness with a small amount of sweetness. The finish holds on for just a bit with a kick of more bitterness. The flavors fade fast in the mouth and leave behind a slight bitter after taste. The mouth feel of Left Hand Brewing’s 400 Pound Monkey is heavy for what the appearance would lead you to expect. Overall, this an enjoyable beer with a interesting mix of characteristics. The finish leaving behind a bitter after taste leans this beer to not be a session beer, but it would be great with a mix of other beers.